Living in luxury is one thing that you could certainly experience once you put this bracelet on. 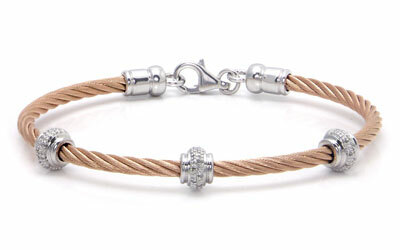 The rose gold color of the bracelet gives an elegant style while the sterling silver creates a dazzling look. Moreover, there is one more feature of this bracelet that would make people turn their heads on you, which is the sparkling diamonds on it. Such prestige to have this kind of accessory.